English Afternoon tea in bags from Harrods (I’ve finished this since snapping the pic, and now have another cute container for my office supplies); Bird’s Tongue Jasmine (from R’s stash, brought back after a trip to Hong Kong – she took the rest of her tea back, but left me this because I love it so much); Decaf Earl Grey and Strawberry Green tea from Kusmi, purchased on a trip to NYC. Some decaf favorites: Wissotsky Fruit Galore (tart and tasty); Celestial Seasonings Mint Magic (a childhood favorite); Republic of Tea Hibiscus Coconut Superflower (for when I need a taste of the tropics at my desk); Traditional Medicinals Chamomile with Lavender (another favorite – I keep a box at home too); Tazo Wild Sweet Orange (just one bag that was floating around my desk, and has since been consumed). 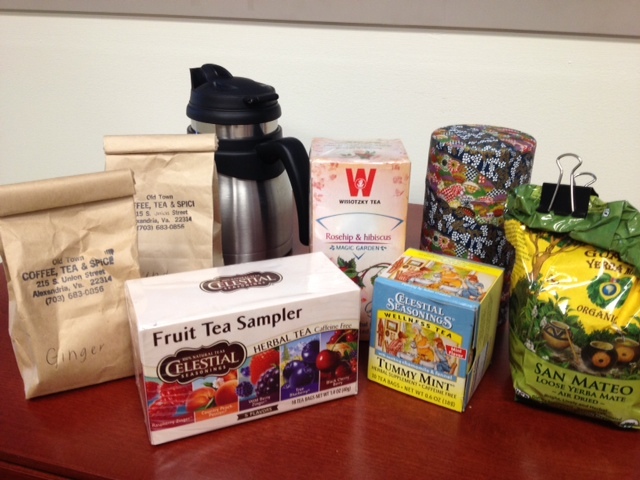 My work tea stash wouldn’t be complete without a few D.C. favorites! Earl Grey and Green Tropical Tea from The Spice and Tea Exchange (favorite Old Town tea purveyor); Chai, World Peace, Ginger Ginseng, and Now & Zen from my beloved Teaism. So there you have it! I’m sure the stash will grow the longer I’m in this job. Do you keep a drawer of tea at work? Do people think you’re totally weird? My coworkers do. Ummmmm, so. Back in… er… 2011, I gave you a tour of my ridiculous tea cabinet at home and embarrassed myself by telling you that I sometimes perch on the kitchen island and gaze lovingly at my tea (and R’s tea) in the evenings. (I don’t really do that anymore. It’s still good entertainment but it’s not really conducive to sprinting up the stairs every ten minutes to soothe a fussy infant.) And then I told you to “stay tuned,” because Part II was coming up and I was going to show you around my work stash. And then I… didn’t. Bunch o’ bags. Twinings English Breakfast tea, gigantic box purchased while pregnant (before hot beverages became odious to me and I had to give up caffeine anyway on account o’ the IUGR); Tazo Om for afternoon zen; Tazo Wild Sweet Orange (a gift from sis-in-law G some years ago, and I loved it so I just kept buying it); Republic of Tea Good Hope Vanilla, also purchased while pregnant because rooibos was supposed to be good for lil baking peanuts (again, before hot beverages became odious to me and rooibos tea in particular killed my soul). Some of my beloved loose tea makes an appearance, finally! We’ve got Ginger Black and Lavender Earl Grey from Old Town Coffee, Tea & Spice in Alexandria (that store is like a rabbit hole, you fall in and you ain’t coming out again); Celestial Seasonings fruit tea sampler purchased because my Target stopped carrying True Blueberry and this was the only way I could scratch the itch; Wissotsky rosehip and hibiscus tea, which is the closest thing I can get here to the rosehip and hibiscus tea from the German store in Buffalo; Celestial Seasonings Tummy Mint (I’m a litigator, I need this stuff); and Guyaki Yerba Mate in both the canister and the yellow-and-green bag. Finally, my good stuff. I don’t keep much really nice tea at work because I like to save my best stuff to enjoy with a book at home. But I have a little bit on hand for nice morning treats. Kusmi Strawberry Green, Vanilla Bourbon and decaf Earl Grey, all purchased in NYC while preggers, but after the hot beverage aversion had started to wear off a bit; Teaism sweetened matcha powder for mixing into green tea (I’ll probably take this home and use it for smoothies); Teaism Chai, Golden Monkey, Jasmine and World Peace – some of my favorites. I have to have World Peace whenever I need it, so I keep a bag at home and a bag at work. It’s that good. So, there you go, my promised work stash tour, only a year and a half later. I’ve made a concerted effort not to bring much tea into work until I drink down some of what I have, so this is really not too ridiculous of a stash. Certainly better than my home stash, which is just silly. Are you a tea drinker? Do you have a giant stash, or are you a reasonable, responsible adult about your tea drinking? Sometimes I think I missed my calling. Wouldn’t it be fun to design cocktails? Swanky, gourmet, delicious cocktails? I had this one in mind for Thanksgiving and thought about it for days. I love ginger and it’s such a holiday flavor for me (although don’t get me wrong: I’ll eat ginger anything, any day of the year). This cocktail came out just as I imagined it – sweet, slightly warming, fizzy and perfect for a holiday celebration. We toasted to Peanut’s first Thanksgiving with it, and it’ll be on my Christmas menu too, and probably New Year’s. It’s just that good. Prepare four Champagne flutes with a few candied ginger pieces in the bottom. Add ginger-infused syrup, dividing equally among four glasses. Add ginger liqueur in equal part to the syrup. Top with sparkling wine (fill glass to the brim – it’s a celebration!). I wrote this last year in response to a request from my father-in-law, and thought it would be nice to bring it out again this year. If you’re having trouble deciding what wines to serve this holiday season, here’s a little something to get you started! Well, friends, it’s the most wonderful time of the year! Time to gather with family and friends around the fire… sing carols… light candles… generally make merry. And what’s merrier than wine? You might be wondering what bottle to bring to your in-laws, or what to pour if you’re hosting, or what to chug when your Aunt Matilda corners you and demands to know when you’re going to learn how to hold onto a man. Look no further, darling readers, because I can answer all of those questions and more. First things first – sparklers! There’s nothing more festive than a glass of bubbles. But please, oh please, don’t call these wines “champagne.” Repeat after messy: “Champagne comes from the Champagne region of France. Anything else is sparkling wine.” Actually, sparklers can have different names depending on their country of origin. For instance, a sparkling wine from France, but not from Champagne, is called cremant. If it’s from Spain, it’s cava. Italian vintners offer up Prosecco. Listen up, now, there’s nothing, I repeat, nothing wrong with drinking a sparkling wine that’s not from Champagne. This weekend hubby and I had a wonderful rose Cremant d’Alsace (a.k.a. a rose sparkler from the Alsace region of France) by Wolfberger. Check it out. It was dry and berry-rific and luscious. And you can’t go wrong with anything from my absolute favorite California sparkling wine producer – Domaine Carneros. Anything from their widely-available brut to their lovely rose to their high end “Le Reve” wine is phenomenal. There’s no better wine for a celebration, in my opinion, than a sparkling wine. White wines are always a good option at the holidays, because pretty much everyone will drink them. There are a few people who will only drink red, but in my experience most people will happily drink white wine. But they can be tricky at the same time, because they vary widely in terms of body, aroma and flavor. For instance, while a crisp, refreshing sauvignon blanc is absolutely delicious, it’s probably better suited to quaffing pool-side while noshing on a farmers market salad sometime in July. For fireside sipping, you want something with more heft. Consider a California chardonnay (I love the offerings from Carneros, the Russian River Valley, or Santa Barbara). One widely available chard that smells and tastes like a small-batch production instead of a mass market wine is the Sonoma Coast Chardonnay from La Crema. My parents introduced me to this wine and I could have sat with the full glass in my hand all night, just breathing in the aroma. (Don’t worry, I did eventually drink it.) La Crema’s Sonoma Coast is available in pretty much every wine shop I’ve been to, and at around $20, is a good value for an excellent wine. Or you might consider a white Burgundy. These wines are also, generally, made with chardonnay grapes, although a few Burgundy producers also offer up aligote. (But it’s extremely difficult to find in the U.S., so don’t worry about accidentally buying it. If you buy a bottle of white Burgundy from an American wine store and they’re not making it super obvious that it’s aligote, it’s definitely chard.) Burgundy wines follow the French classification system, as they must. French wines are generally classified into Grand Cru, Premier Cru, Village, and table wine, depending on the location of the vineyard the particular grapes hail from. Grand Cru is the best, is almost certain to be prohibitively expensive (especially after you toss in the cost of importing it) and is hard to find. Don’t waste your time looking for a Grand Cru, unless you are proposing and have a wad of cash burning a hole in your pocket. Premier Cru, the next-best designation, is still expensive, but you can find a reasonably-priced bottle now and then and it’s very, very good. Village wines will – duh – include the name of the village on the bottle. If you have a well-stocked wine shop with a French focus, you’ll likely find a bottle or two with a Village designation, and they’re generally very good. And of course, you can’t go wrong with a wine from Burgundy sub-region Chablis. Chablis produces all white, all chard, no oaked, and its wines have a delicious, refreshing flinty character. Chablis wines are some of my absolute favorites. Just please, please don’t buy anything labeled “California Chablis,” or my heart will shed tears of grape juice for you. If you are serving a roast, or you just like reds better than whites, there are many, many options that would work wonderfully for the holidays. First of all – wine purists, please feel free to close your eyes and start humming now – you can’t ignore Beaujolais Nouveau. Great wine it is not. So what is it? Fun, fruity, festive and cheap. Yes, there are plenty who scoff at Beaujolais Nouveau, saying “if I want candy, I’ll eat candy, goshdarnit!” – and maybe, maybe those types will consider the slightly earthier Beaujolais-Villages. Which is good too. But you shouldn’t dismiss Nouveau. The current season begins with a release of bottles in early November, and those bottles are really only good until Valentine’s Day. But if you’re entertaining a group that likes their wines flighty and fruity – and drinks some volume – consider Nouveau. Okay, say you’re too snobby for Beaujolais Nouveau. (You’re missing out, but whatevs.) Try bringing a little South of France sunshine to your holiday with a Cotes du Rhone. The Cotes du Rhone region is found in Provence – land of suntans, olives and lavender, and lovely grapevine-planted hillsides (like in the picture heading this post). The wines are luscious and fruity, but earthy at the same time. Cotes du Rhone wines come at all different price points – you can pay top dollar for a bottle from neighboring region Chateauneuf-du-Pape – but many Rhone reds are a very good value for the excellent quality of the wine you get. Hubby and I drove through several towns in the Cotes du Rhone last year, and we’re particularly fond of Gigondas, where we had lunch (and I drank a carafe of local rose, nearly without help, and then slept all the way to Burgundy). A good wine shop will probably stock a few bottles from Gigondas and nearby Vacqueyras, but if you look even closer for offerings from tiny Provencal villages like Sablet and Seguret, you’ll be amply rewarded. A good Cotes du Rhone will set you back anywhere from $15-30, so they’re not cheapie wines, but provided you like your dinner guests, you’ll find these wines are worth more than their price point. What are your favorite holiday wines? And happy sipping, friends! Travette Tea Pot. This is my number one recommendation, because no product has changed my tea-drinking life the way this little guy has. When I first got into drinking loose leaf tea, I looked long and hard for a way to perfectly brew a cup. M, my colleague who introduced me to the joys of drinking loose tea, brewed hers in a drip coffeemaker (which she only used for tea) and that worked for her. But I wanted something smaller and more portable. I tried tea balls, a teastick, and special mugs with tea infusers that fit into them – some were better than others, but none were perfect for me. They either allowed too many leaves to escape, or they dripped all over my desk, or both. Then I found the Travette Tea Pot at Teaism. And the clouds parted, and I saw clearly for the first time. The Travette has a fine mesh basket that fits into the pot and allows nothing – I mean nothing – to escape. It makes enough for two mugs, and if you pour the first mug out the basket is suspended above the water line, preventing over-steeping. And the double-walled construction means the pot keeps the second cup piping hot while remaining cool to the touch from the outside. 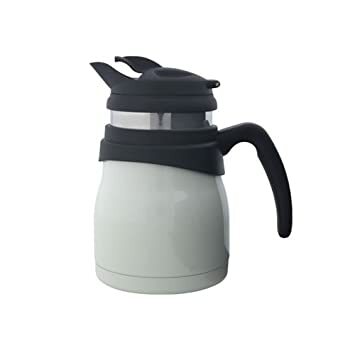 This would be a perfect gift for someone who is looking to get into drinking loose tea but is nervous about brewing it – the Travette makes brewing the perfect cup of tea absolutely foolproof. I have two – one at home and one at work – and I can’t remember life without them. 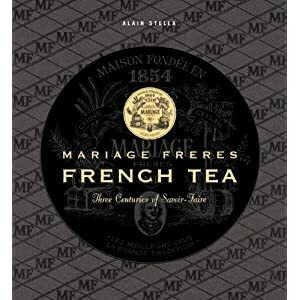 French Tea: Mariage Freres – Three Centuries of Savoir-Faire. Mariage Freres is the ultimate tea purveyor. I’d say “in my opinion” but I don’t think there can be any debate. Mariage Freres is just the best. This gorgeous book tells the story of the company, from its founding to present day, and includes some stunning photographs. I keep my copy on the coffee table in my reading nook and flip through it whenever I want a little eye candy or relaxation. Sipping a cup of Mariage Freres tea while reading isn’t required, but it sure does help. Upcycled Tea Spoon. I have this “Peace Love Tea” spoon from SycamoreHill on Etsy and I use it every ding dong day to scoop my loose tea into my Travette Tea Pot – it scoops the perfect amount for one cuppa. It’s a fun, unique gift and probably something the recipient would never think to buy for him- or herself. Handmade Teacup. I love the sky blue handmade mugs that my mother-in-law gave to me (a Christmas gift one year) – in fact, I’m drinking my breakfast cuppa out of one of them as I write this post. A beautiful mug or teacup can truly elevate the tea experience, and it’s an extra special bonus if the cup in question was a gift from a loved one. You could search Etsy or craft fairs for the perfect ceramic mug (the mugs my mother-in-law chose happen to be one of my favorite colors, and the organic shape lifts my spirits every time I look at them – I know that she was truly thinking about me when she chose them), or you could pick up a pretty vintage teacup (maybe one with a saucer!) at your local antiques shop. 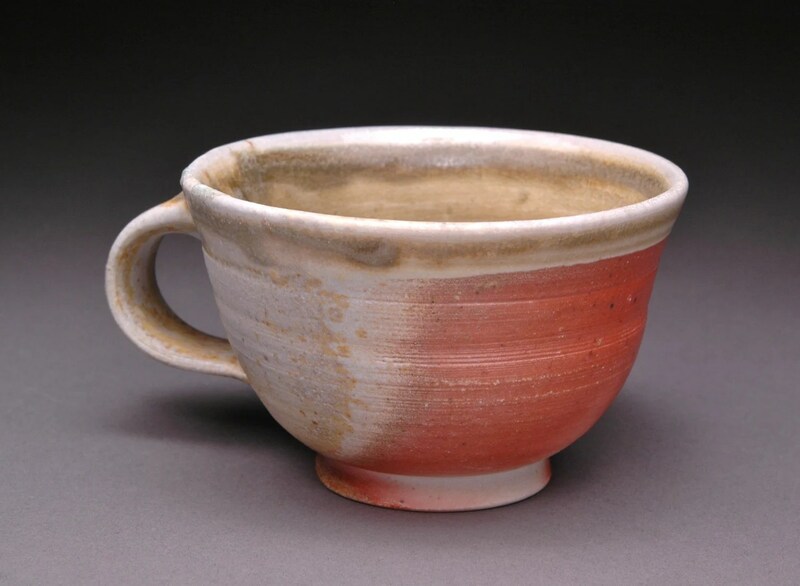 There are as many unique mugs out there as there are tea drinkers, and if you go this route, the recipient will think of you with a smile every time he or she takes a sip. As cool as it would be if I was paid to write for a living, I’m not. This post wasn’t perked or paid for by any of the manufacturers mentioned, and everything I recommended I actually own, use, like, and paid for with my own money or was gifted by a thoughtful friend or family member. If I decide to run off and join a hippie commune… just a dream I had… I’d totally take this stuff with me but none of the sellers would ever know the difference. Tea lovers – what gift would you love to get to celebrate or further enable your habit? The English do love their hot beverages! (Not everyone does, I’m sure, but there does seem to be a widespread ritual of drinking tea, coffee, or cocoa on a daily basis.) And since I love tea, too, we tend to be in agreement. There are few restaurants in England where you can’t get a little pot of tea anytime you want it, and the tea ritual for a traveler could be anything from popping into a cafe for a morning cup, to a welcoming brew prepared by your B&B hosts, to a small or large afternoon tea in just about any location you can imagine. I’ve had all of the above, and then some. So let’s imagine that you’ve walked into one of the fancier tea establishments – the Orangery in London, for instance (or the Ritz or Savoy or Harrods), or the Pump Room in Bath, perhaps. Think you can eat all of that? My first “afternoon tea” was in Keswick in 2008. It wasn’t our first stop on our northern England road trip – that was York, but we were too jet-lagged and busy seeing the town to really focus on tea. So once we got to the Lake District, we made it a point to have an afternoon tea. We popped into a little bakery on Keswick’s main drag, with a tearoom upstairs. I was looking forward to the tea sandwiches, and the pastries, and obviously the tea itself, but not to the scones. The only scones I’d had were the doorstops that Americans tend to bake and then try to pass off as fluffy biscuits (c’mon, fellow Yanks – admit it; we’re not fooling anybody with those bricks). So I had the entirely reasonable idea that I hated scones. However, because we were in England, I told myself I was going to be a good, open-minded traveler and try scones in their native habitat. I couldn’t have been more shocked – they were nothing like I was used to at home. Warm, soft, and buttery, studded with currants – those scones were divine. I piled my bites with clotted cream and sweet jam, and scones became my second-favorite part of an afternoon tea (the tea itself must always come first, of course). Roll on back to your hotel and reflect on the fabulous treat you just had. No one does afternoon tea like the English do. Cheers!